Arizona Roof Rescue is a full serviceroofing company in Glendale Arizona, serving the phoenix metro area and surrounding cities. We have been in business for nearly four decades, and have amazing reviews on both the better business bureau and service magic (now called home advisors) from our clients. We also have hundreds of satisfied customers, who come back to us time and again for a repeat of the excellent service, quality work and affordable pricing that made them fall in love with Arizona Roof Rescue in the first place! We are a full service roofing company, providing licensed bonded and insured service for both residential and commercial clients. We are a contracting company that believes in customer service, client relations, and making the world a better place through roofing. We provide affordable service for people who really need it. When your roof is leaking and your family is at risk, you need help, you do not need unscrupulous construction people trying to gouge you on price or do repairs you do not need. We are the company our clients can trust, the roofer with ethics. 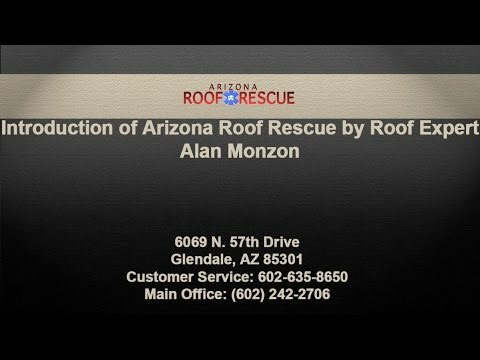 Alan is the owner and operator of Arizona Roof Rescue, and a life long, second generation roofer. Alan’s skill on the roof and expertise at fixing any problem have earned him a reputation as the roofing contractor who can handle it, the construction guy who can fix any problem. Alan Monzon is also an Arizona resident and has been living and roofing in the Phoenix Valley for over 20 years. He has made his home here and raised his family as true Arizona natives. His love for this land and his pride in his work make Alan a partner you can rely on; he is someone who cares as much about saving you money and protecting your home as you do. View our profile on HandyAmerican.com. Helping navigate consumers in the direction of reliable Roofing Contractors since 2004.